1. Download the IDrive application. the files/folders you wish to backup. backup or schedule it as required. Your files are encrypted using 256-bit AES encryption and are quickly transferred to your IDrive account. Data is the life-blood of your business, an asset you would never want to lose. Onsite data storage using NAS (network attached storage) devices, such as Netgear, is a good and cost-effective way to protect your digital data, as it ensures faster backups and recovery. However, complementing the on-premise data storage with a reliable offsite backup solution ensures that your business recovers from any data disaster with ease. 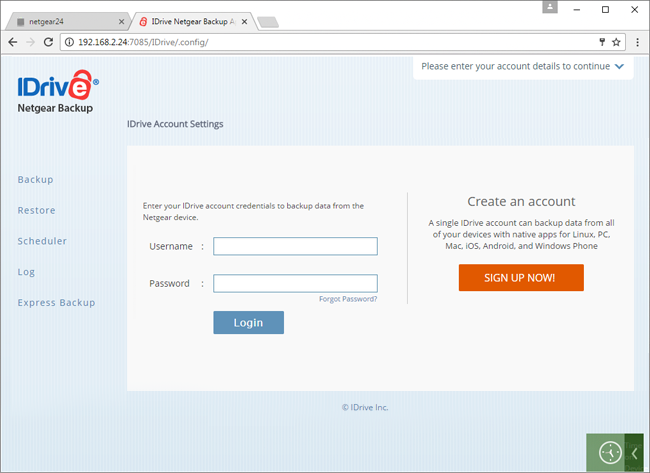 IDrive online backup provides your data the protection it needs. The IDrive solution is secure, scalable, affordable, and it comes with a dedicated Netgear Backup app, which makes online data backups, from your Netgear storage device, faster and simpler. You can backup your NAS device to the same account that can backup your other computers and mobile devices. 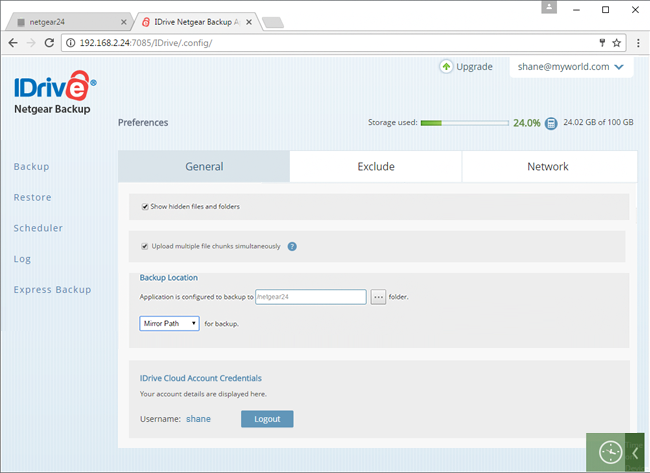 With IDrive’s Netgear Backup App, you can perform immediate backups and restores, automate your data backup jobs, receive email notifications on completion of scheduled operations and view all of your activity logs in detail. Sign up for an IDrive account to get started. Choose your Netgear device series and model you want to backup, and click 'Download Now' to download the DEB file for your Netgear model. The selected Netgear model number is either incorrect or not supported by IDrive. 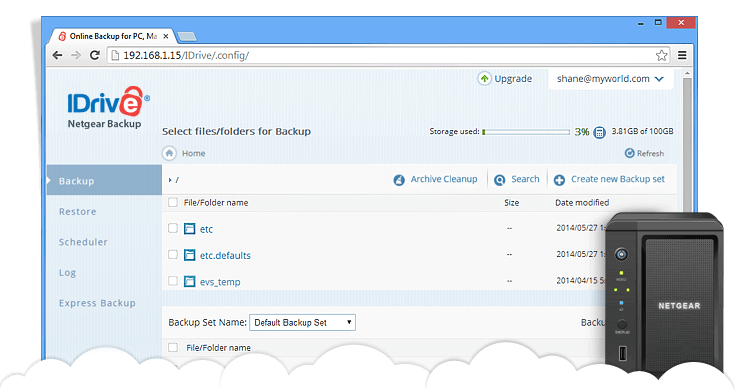 Archive Cleanup deletes data from your account, by matching them to the data in your current backup set. The Netgear backup App has separate installers for all the supported Netgear models. On the Netgear Admin page, select the 'Apps' tab. Now click 'Refresh'. 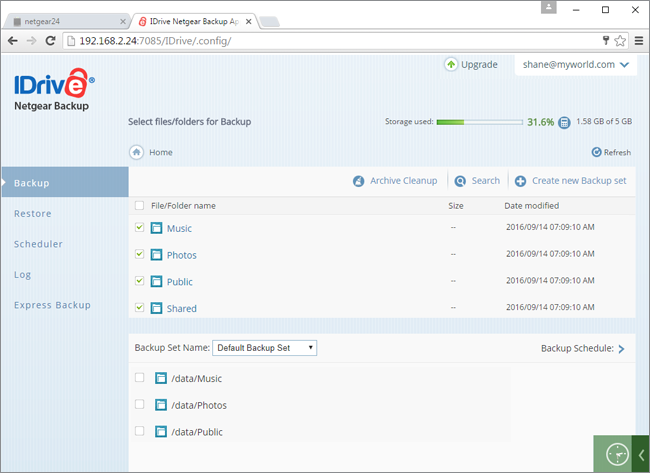 The IDrive Netgear Backup app will be visible under the 'Installed App' tab. Click 'Launch' under the IDrive icon to launch the app. On the Netgear Admin page, navigate to 'Apps' > 'Installed Apps' tab. Under the IDrive icon, click 'Remove'. On the confirmation message dialog box, click 'Yes'. The Netgear backup app is uninstalled successfully. A physical storage shipment solution for NAS users to backup and retrieve bulk data, within a week or less. How Netgear Express benefits NAS users? Using Netgear Express you can transfer large amounts of data from a NAS device to your IDrive online account in under a weeks' time. Your data is secured during transfer and storage with military grade 256-bit AES encryption and an optional private key. Once initial data transfer is complete, you can perform incremental backups for data protection. Data transfer via physical storage shipment ensures zero bandwidth consumption. 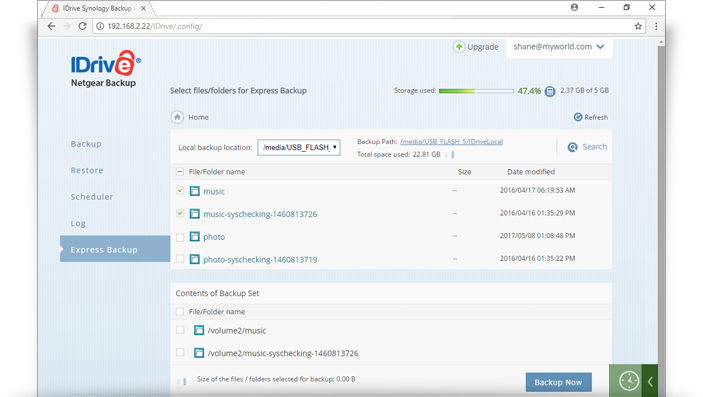 The Express Backup service is Free once a year for Personal users and thrice yearly for Business users. Subsequent backup requests will be subject to the $59.95 charge. Express Restores will be charged $99.50 per request. The Netgear Express service includes free return shipping for customers within the USA. Additional shipping costs may apply for Express orders shipped outside the USA. Upon placing the order, our team will provide a shipping quote that will be charged separately. After receiving the express storage device, transfer data from your NAS device to it. Ship the device back to us and we will transfer your data onto IDrive's primary storage devices. Upon receiving your request, all your backed up data stored in the IDrive cloud account is transferred onto the express storage device and shipped to you. 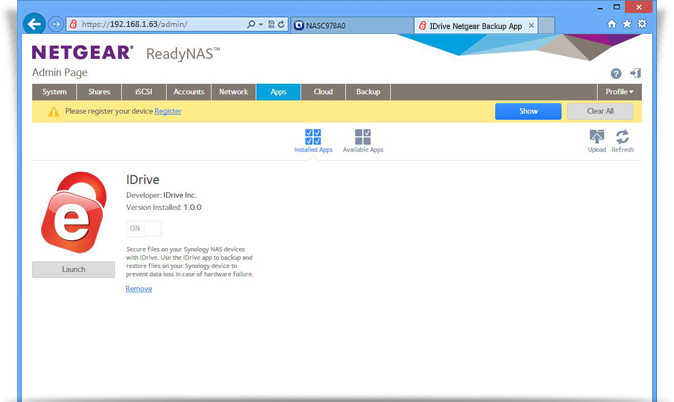 You can then easily perform instant restores to your NAS device.